Front opening yellow snap frames allow graphics to be changed quickly and easily without having to use any tools or remove the frame from the wall. Our Yellow Snap Frames in RAL 1021, are perfect for posters that need to be displayed professionally and changed often. All four sides of the frame 'snap' open to allow very easy access, and are very easy to use and change the contents on a regular basis. Available in a range of both standard and bespoke sizes you are sure to love our yellow poster frames. 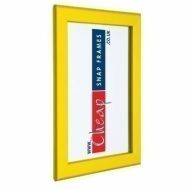 Bright yellow poster frames from only £17.60 + VAT and delivery. Delivery is £10 to the UK mainland and London.